Stone Balanced Lion - Ring - AKA "Two Of Earth" for the 78 Tarot Elemental Deck. Two Of Pentacles is an Earth card, So I wanted to include lots of sto..
Christmas Kitten Boy - Ring - An adorable snow white kitten peeking out of a festively wrapped holiday gift. He is sitting by a twinkling Christmas tr..
Walter The Artist - Ring - Walter is quite the Artist! Behind him is his colorfully painted canvas with streaks, splatters, paw prints, and other fun ..
Day of the Dead Cat Moon - Ring - Día de los Muertos Gato, A stylized moon cat for the Mexican holiday Day of the Dead. A bright full moon surrounded ..
Day of the Dead Cat Princess - Ring - Día de los Muertos Gato, A beautiful princess cat wearing an ancient Aztec Tiara of silver and turquoise. She is..
Cy and Sal Space Explorers - Ring - AKA The "Page of Wands" for the 78 Tarot Astral Deck. 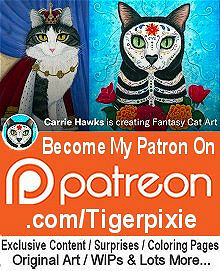 The Page of Wands is a fire card representing exploration, d..
Day of the Dead Cat Candles - Ring - Día de los Muertos Gato, A gorgeous black and white cat wearing an ancient Aztec necklace of silver and turquoise..
Voodoo Cat Doll - Ring - A creepy cute patchwork Voodoo Cat Doll with three little pins stuck in her. She's still as happy as can be with her stitched..
Little Purple Horns - Ring - A cute big eyed kitten with little purple horns all dressed up for the 1980s with a big purple bow and plastic char..
Day of the Dead Cat Skull - Ring - Día de los Muertos Gato, A striking black and white illustration of a black cat painted as a sugar skull cat, frame..
Dorian Gray - Ring - My own cat version of Oscar Wilde's handsome, narcissistic, immortal, Dorian Gray. He's in the attic standing in the candlelight ..
Cheshire Cat - Ring - My version of the Cheshire Cat from Lewis Carroll's Alice's Adventures in Wonderland. He has his classic Cheshire Cat Grin in a ..